Woodbine's CEO and President Jim Lawson congratulates trainer Sid Attard, who is joined by family and friends in the winner's circle on July 22 to celebrate his 2,000th career win. 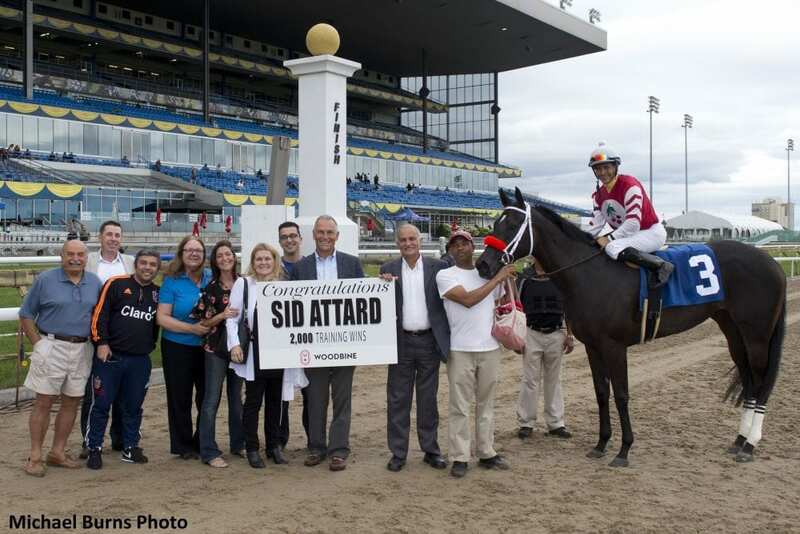 Hall of Fame horseman Sid Attard celebrated a significant milestone on Sunday at Woodbine Racetrack as he earned his 2,000th career training win. The 67-year-old Brampton, Ont. resident reached the milestone mark with a victory in the afternoon's ninth race courtesy of Martin Cherry's maiden-breaking three-year-old filly Lady With Class ($5.50), who sprinted through along the rail and won by four lengths in 1:11.26 over six furlongs with Ademar Santos aboard. Born in Malta, Attard followed the lead of his brothers, Joe and Tino, to pursue a career in horse racing when he moved to Canada and took out his trainer's licence in 1977 at the age of 26. Attard earned his first win with Scroll of Fame on April 1, 1977 at Greenwood and the 1980 Mazarine at Woodbine with two-year-old filly Lady Sheppard was the first of more than 100 stakes wins in his Hall of Fame career. Attard, who has been a top trainer at Woodbine for decades, enjoyed a career-year for earnings in 2004 banking $3,844,401 in purses and posted a personal-best 78 wins in 2006. His trainees have earned more than $61.1 million in purses lifetime. Among his top horses, Attard campaigned Sovereign Award winners Ginger Gold, One For Rose, Numerous Times and Interpol. Numerous Times upset the defending champion and Horse of The Year Quiet Resolve in the 2001 edition of the $1 million Atto Mile (Grade 1) at Woodbine. Interpol provided Attard with another Grade 1 highlight more recently, winning the Northern Dancer Turf Stakes in 2015. Attard was inducted into the Canadian Horse Racing Hall of Fame in 2013 and the Brampton Sports Hall of Fame in 2011. Live Thoroughbred racing continues at Woodbine on Wednesday, with first race post time set for 6:45 p.m. This entry was posted in NL List, People and tagged 2000 wins, canadian horse racing hall of fame, ginger gold, interpol, numerous times, one for rose, Sid Attard, trainer, woodbine, Woodbine Racecourse by Woodbine Communications Office. Bookmark the permalink.